Boy did it rain last night. It battered down. So much so I was concerned that the neighbouring river would flood and we would be swept away. Needless to say I did not sleep well and awake to find is still bloody raining. Well that is it. I hear by declare that I resign from my role as rain goddess. I have served my time. Just as Death himself, in the brilliant book "The Book Thief" by Markus Zusak wished to pass his role onto another so did I. It was time some other poor unsuspecting soul had the displeasure. Neither of us fancied a shower in the uninviting toilet block so after breakfasting on bread and cookies we pack up. At least the rain is lighter this morning mere drizzle, but drizzle is still wet harumph! Once again we stick to our plans to travel along the A roads. Today that decision seems to be paying off. The drizzle eases and although it remains cold and damp my spirits are high. The scenery is changing as the landscape, no longer flat begins to give way to hills. The rivers remain extremely swollen and in places have burst their banks. I do not see any homes under water but a few gardens and parks are now underwater. On route I notice hotel rooms advertised at a reasonable rate of €30. 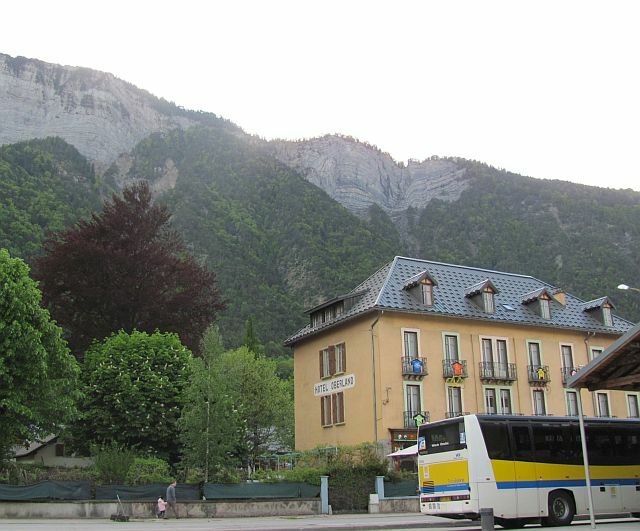 The prices at the beginning or the trip for hotels were around €45 so things seem cheaper along the road to Grenoble. Luckily today I am not tempted to abandon camping. But it is good to know that these hotels are available if the worse comes to worse. The petrol prices so far have varied from around €1:45 to €1:66. As is always the way you can guarantee that when you need petrol you just so happen to be in the areas where the petrol is the most expensive. 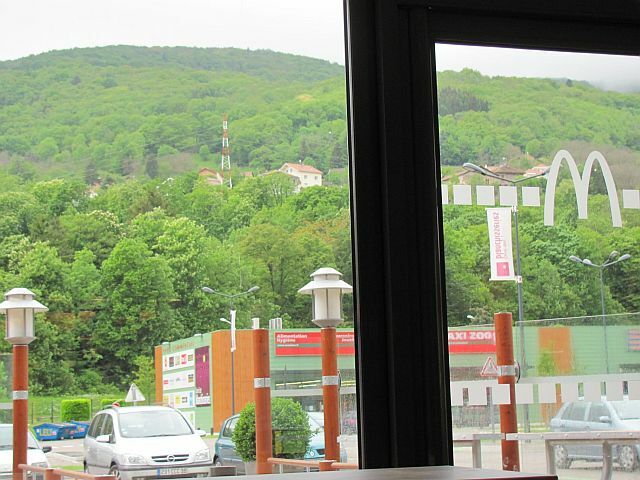 The scenery continues to improve the further we travel and by he time we stop at a McDonald's at Bourg-en-Bresse for a drink and a weather update we are surrounded my lush green mountains. The view from the McDonald's is stunning and so is their Cappuccino. I mean like WOW!! 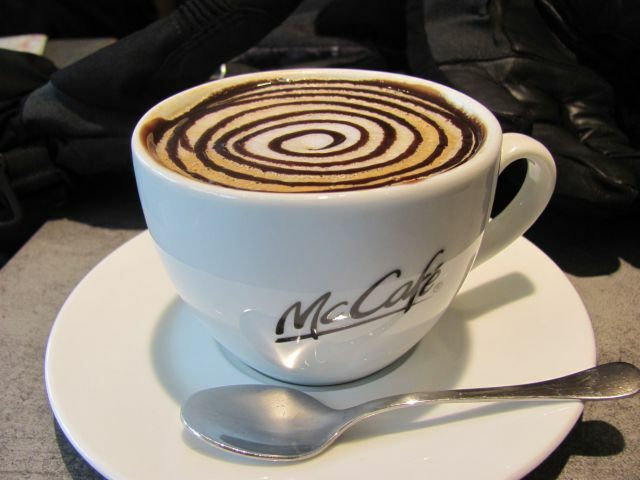 I never expected to find one of the best ever Cappuccinos in a McDonald's but here it is. I am truly happy as I sit here with this delightful surprise gazing through the windows at the amazing scenery. Back on the bike and we have to join the motorway for a short stretch. It is crowded and traffic is moving slowly. The clouds begin to thin, the sun bursts through and two amazingly vivid rainbows stretch across the sky. I cannot help but grin because rainbows always remind me of my mum. Her requested funeral song was Over The Rainbow. So for me this is my mum saying hi to me and also wishing Megan a Happy Birthday for tomorrow. I like to believe in a little magic. After leaving the motorway we find ourselves on a wonderful mountain road. Steep jagged mountains topped with snow align the road. Trees of abundant variety display amazing colours and vivid hues. It is veritable feast for the eyes. The road twists and turns and beyond every bend is another amazing, delightful view. This is it, this is what we came for. This is what makes days of rain worth the trial. WOW, WOW, WOW. I am loving this and my face aches from grinning so much. We are eventually brought to a halt in an Alpine village by the route ahead being closed. I can only assume because of the snow. So we decide we will look around here for camping because this area is stunningly beautiful. Sorry do I keep using words like stunning and wonderful and beautiful over and over. You will just have to bear with me because the English language just does not contain enough words to express how blown away I am. It seems a good time to phone the girls for a check in. But I can not get a signal. Oh no, if I can't get a signal we may have to move on. It is my daughters birthday tomorrow so I will have to have a signal for then. Just then yet another rainbow appears and with it I suddenly get a signal. Thanks mum, like I said I believe in magic it makes life a little less dull and err ... magical. So all we need to do now is find a suitable campsite in this area of dramatic vistas. Should I tell you the name of this place or should I keep it a secret? Oh go on then I shall share it with you, it is, wait for it ... drum role ... 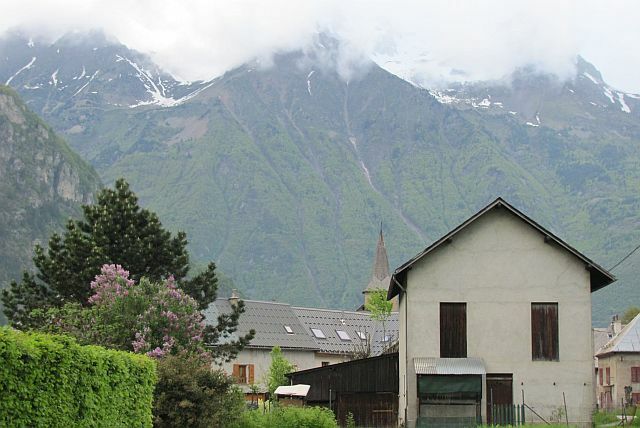 Le Bourg-d'Oisans. Go on put it into Google right now and tell me once you see the images you are not itching to go there? It is the Alpine dream. It is is, ohh how to describe it... it is... PARADISE. Yes that's is the word I have been looking for Paradise. 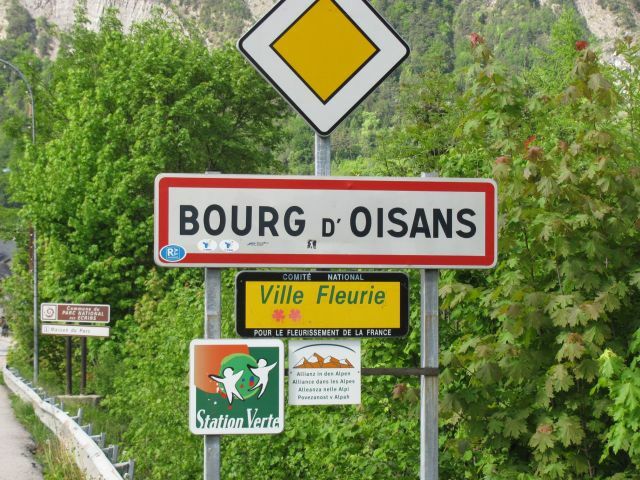 Le Bourg-d'Oisans is a paradise, it is an adventure sport or extreme sport paradise but most importantly to us it is a BIKERS PARADISE!!. At €20 it is not cheap but it is worth it. Do not be put of by the owners enormous, overweight dogs barking at you. It is just their way of letting the owner know new guests have arrived and are requiring attention. Not a prelude to eating you. Although with their bulks one could be forgiven for thinking their may be a few missing tourist hidden inside their bellies. Basset Hound and Samoyed shut up as soon as the owner arrives and collapse in the sun. Yes I did say sun, the sun shines in paradise of course. 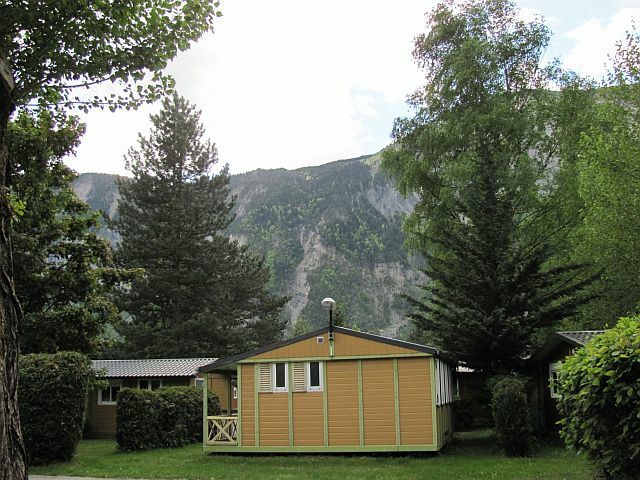 If you do not fancy camping there are little wooden huts available. Very pretty but at €65 a night also very expensive. 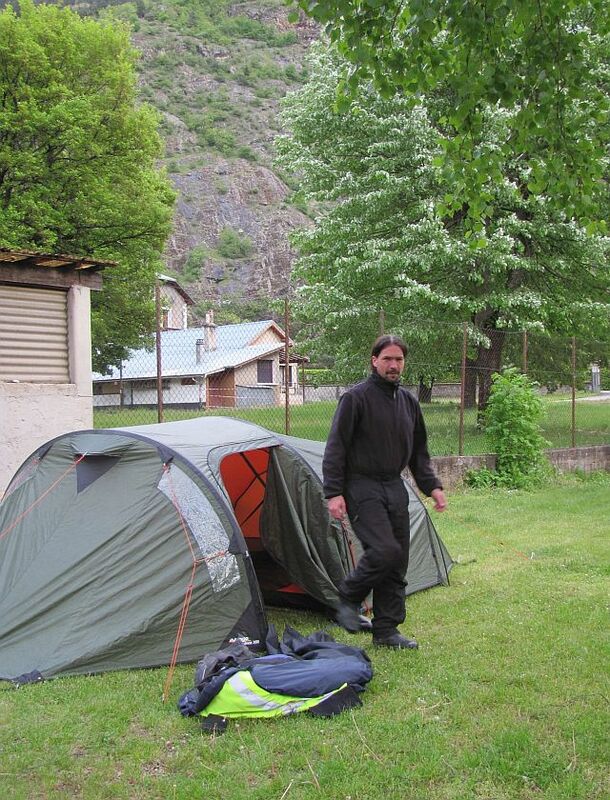 It is a joy setting up camp in these dry and beautiful surroundings. After a look around the site I return to find the bf deep in a conversation with another fellow camper. I join them as does the wife of Franz. The couple are Dutch and an absolute pleasure to talk with. Their English is faultless and they are warm and friendly. I could stand here forever talking to this delightful and interesting couple but night time has brought about a sudden dip in temperature and the cold causes us to take our leave and retire. As I climb into my sleeping bag with the thermals once again firmly in place I ponder over what Franz told me of how it is usually 25 degrees at this time of year. How the pool is usually full of sun kissed tanned campers hiding in the water from the heat. And for once that does not sting too bad. Because I have had one of the most amazing and exhilarating days of my life. Now if I just could stop my face from aching from the grin that refuses to leave it I might get some sleep.